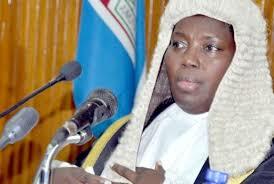 Speaker Rebecca Kadaga presides over a past Parliamentary session. File photo. KAMPALA–The High Court on Wednesday extended the hearing of the case in which seven MPs are accusing Speaker Rebecca Kadaga of abusing the law, when she suspended them from attending Parliamentary. Justice Ouma Oguli extended the hearing because the accused parties, the Speaker and Attorney General were absence. On Monday, the Speaker suspended Gerald Karuhanga, Ibrahim Nganda, Mubarak Munyagwa, Moses Kasibante and Allan Ssewanyana, are accusing Kadaga of abusing the law..
During the court proceedings, the legislator’s lawyer Erias Lukwago, told Oguli that they tried to serve the Speaker but they were blocked at the main entrance of Parliament. Court wanted the Speaker to appear in person to answer charges raised against her. The suspended legislators are also in the High Court, requesting for a mandamus order.A mandamus order is a command to an inferior court or ordering a person to perform a public or statutory duty. The suspended MPs said Kadaga acted as the law herself and her actions wouldn’t go legally unchallenged.The legislators also argue that the Speaker disregarded the provision of Article 28 and 42 of the Constitution by unlawfully mentioning their names. Security manning Parliament yesterday blocked MP Winfred Niwagaba, who is also the shadow attorney general from serving summons to the Speaker. The security instead wanted him to give the court summons to Parliamentary officials but he refused, prompting the security men to use force to pushed him away.Together with MP Medard Ssegona, they were driven away in Police patrol. Meanwhile, yesterday, MPs voted in favour of amending Article 102b to lift the Presidential age limit. The ruling National Resistance Movement NRM garnered two-thirds majority votes for the second reading of the controversial Constitution Amendment Bill No. 2 (2017).